Favourites Indian Overseas Bank (IOB), Chennai comfortably beat their city rivals Integral Coach Factory (ICF) 77-50 in the finale. Hosts Vijaya Bank secured third place while Customs, Chennai finished fourth. Cash prizes of Rs. 1,00,000/- and Rs. 50,000/- were announced for the winners and runners up, and Rs. 25,000/- and Rs. 10,000/- for 3rd and 4th place finishes respectively. The tournament was played from 31st January to 4th February in Bengaluru, and featured some of India’s top men’s club teams. Bengaluru, 4th February 2018: The 4th edition of the Mulki Sunder Ram Shetty All India Basketball Tournament, organised by Vijaya Bank, concluded a short while ago at the Sree Kanteerava Indoor Stadium in the city. Along with trophies, cash prizes of Rs. 1,00,000/- for the winners, Rs. 50,000/- for the runners up, and Rs. 25,000/- and Rs. 10,000/- for the 3rd and 4th place teams respectively, were announced. Besides these, individual awards were handed out to G A Anto Bethle, ICF (Best Player of the Tournament), Navin Raj, Vijaya Bank (Most Promising Player) and A Aravind, IOB (Best Defensive Player) and Justin, Chennai Customs (Most Popular Player). Managing Director and CEO of Vijaya Bank Mr R A Sankar Narayanan and Executive Director Mr Y Nageswara Rao distributed the trophies and individual awards. IOB Forward A Aravind with a thunderous dunk in the first quarter of the finale at the 4th Mulki Sunder Ram Shetty All India Basketball Tournament. 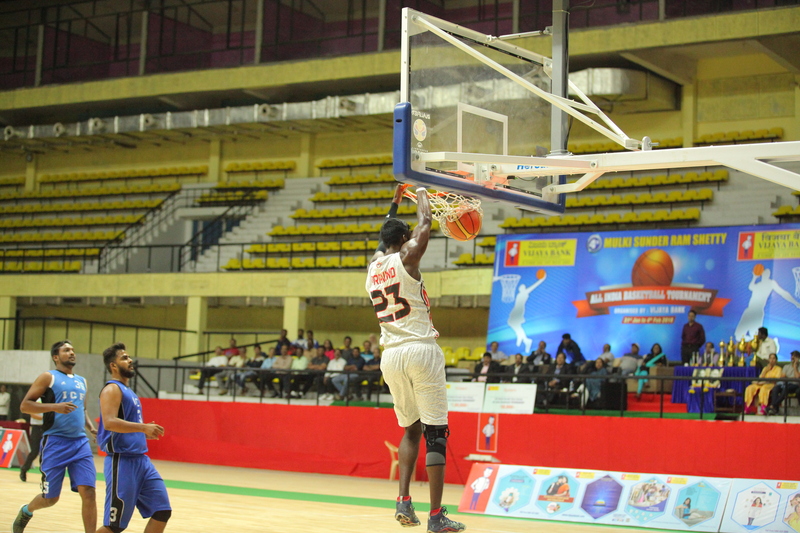 Heavy favourites IOB, Chennai had cruised into the finals with a 33 point win over Chennai Customs. The finale too began where they had left off in the semis, as IOB raced away to an early lead. IOB’s in-form international centre A Aravind controlled the paint with numerous offensive and defensive rebounds. He even had two powerful dunks for good measure as IOB led 19-9 at the end of 10 minutes. But the hard working ICF side too had some tricks up their sleeve. High scoring point guard Anto Bethle pushed the tempo of the game resulting in some acrobatic layups by shooting guard Praveen Kumar. ICF centre P Vijay had his task cut out at both ends of the floor, as he was deftly contained by Aravind. The seasoned IOB side, with numerous former and current internationals, made full use of their deep bench. Slowly but surely, the only eight member strong ICF began tiring by the end of the third quarter. With the wily veteran backup centre Vineeth Revi Mathew too proving to be effective, IOB had built up a strong 60-42 lead going into the final 10 minutes. The fourth quarter was entirely dominated by IOB, which was happy to give its bit players some playing time. ICF Forward K Jeya Venkatesh memorably posted back to back blocks on IOB’s Abhilek Paul in a late possession, but by then it was too little too late. The Bankers from Chennai were pleased as punch to re-emerge champs after nearly four years. Overcoming a sluggish start, hosts Vijaya Bank outlasted a spirited Customs, Chennai side 81-76 to finish third. Last year’s champs, Vijaya Bank started off uncharacteristically weak on the defensive end. They let Customs, Chennai’s athletic backcourt duo of senior international Hariram and southpaw Justin get to the paint too easily. Customs enjoyed a 30-16 lead at the end of the first quarter. But it was only a matter of time before Vijaya Bank rid themselves of their defensive lethargy, as they restricted Customs to just 11 points in the second quarter to go into halftime trailing by just one, 40-41. The second half saw both teams go back and forth, trading the buckets. Vijaya Bank’s backup forward Clinton erred once too often with multiple turnovers that kept Customs closer than they should have been. But Vijaya Bank’s international centre Arvind Arumugam’s re-entry into the game in place of the ageing Sanjay Raj injected fresh life into the hosts. Arvind was able to attract attention and create space for slashing shooting guard Anil Kumar and forward Navin to score easy points in the paint to eventually eke out a five point win. Notably, Vijaya Bank is the only recruiter of basketball talent in the state of Karnataka, and has contributed 12 international players to the country, starting with Olympian Gurumurthy Dileep, who joined the bank way back in 1984. Other international players honed by the bank are former India captain BS Gautham (1986), A Rajkumar (1988), S Stalin (1993), G Murali Mohan (1995),Roshan Thankachan (1999), Austin JM D’Almeida (2001), Sanjay Raj (2002), Arvind Arumugam, Rajesh Uppar (both in 2012), Anil Kumar BK (2016). Including these international stars, in all, the bank has recruited 25 national level players, who have represented their bank and the state of Karnataka with great pride and gusto.